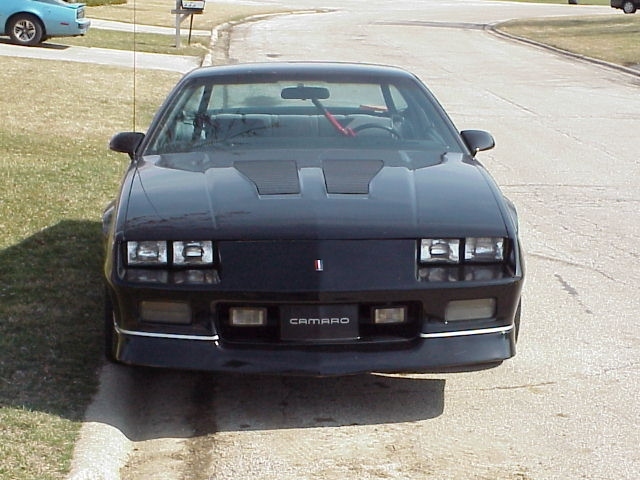 Here you will find info on my 1988 IROC-Z L98 hardtop. I will also put up pics and other info on cars that either my family owns, have owned, or any interesting junk i find. Here is the basic rundown of my car and what it has on it. 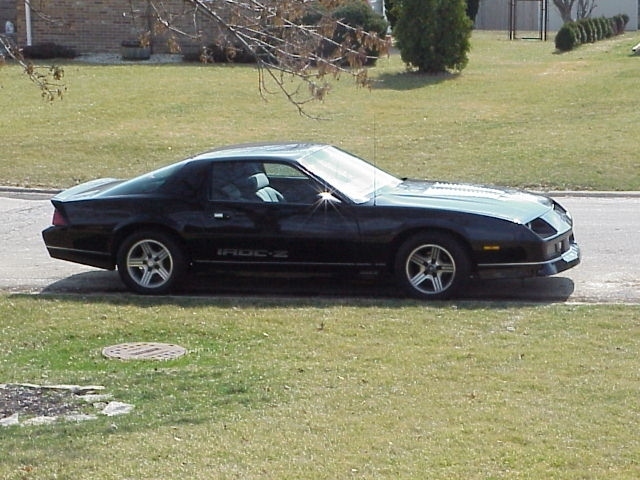 The car is a 1988 IROC-Z Camaro. It was built at the Van Nuys plant in California. It is a L98 hardtop car. Being an L98 (B2L) car it has the 700R4 automatic trans as well. The rear end is the factory australian 9 bolt borg warner unit with factory 3.27 gears. The car also has 4 wheel disk brakes. It has the ERS factory sound system, but I added a Pioneer CD player. The car has the original block and heads, but the motor was rebuilt right before i bought the car. 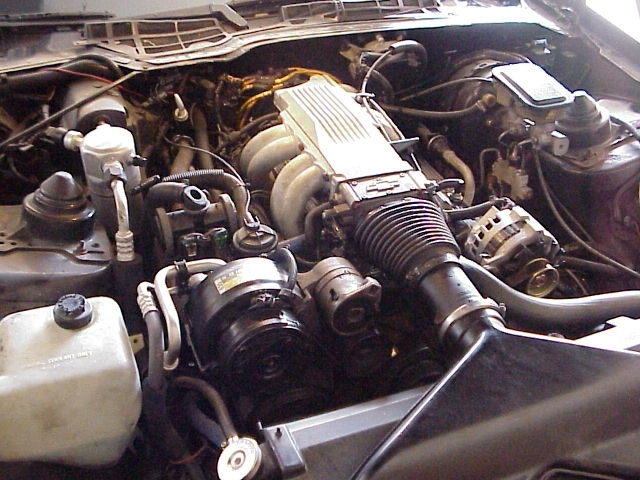 I picked it up with 250 miles on the engine and 120,000 on the chassis. The body is decent, but has some rust. It will be repainted this coming year. Current Best ET: 13.833@99.30(5/1/01)N/A @ RT.66 Raceway in Joliet IL. *NEW* Just added a video of the IROC. Click below to watch it. Above are vaiorus pics of my IROC. I will put more up as soon as i can get my hands on a digital camera. This is my log for any work or mods done to the car. I am going to backtrack just a bit before I started the site, but pretty much everything will be from the day I started the site and on. Pulled the failing 9 bolt that was in the car and installed a new 9 bolt with 3.45 gears. The car seems to pull much harder now with the combination of the TH350 trans and the 3.45's. I also installed a new Y-pipe to replace the old one which had rusted out. Installed a CSI Ultralite starter. 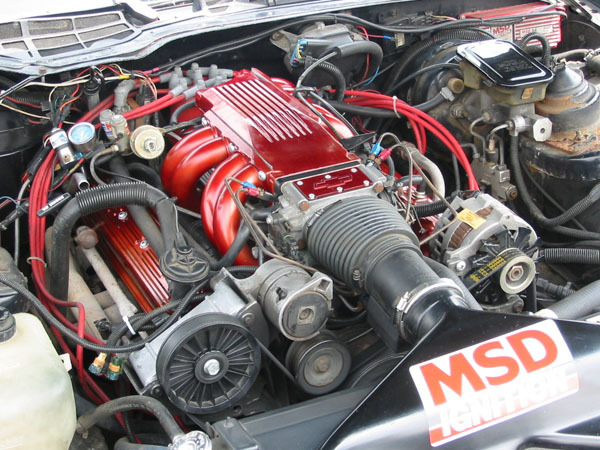 A week later installed a MSD Pro-Billet distributor and MSD Superconductor plug wires. Blew up another trans, and the rear end. All that work for nothing. The ring gear snapped and shocked the driveline breaking the input shaft housingof the trans. I had Max's transmissions install a rebuilt turbo 350 trans and had them rebuild the rear end with 3.27 gears from www.9bolt.com. I got the car back saturday and promptly broke the shifter cable, it never ends. After waiting forever to get a new cable from Summit i drove down to Lane Automotive and picked one up. Got the cable installed and of course the cable from summit was here when I got home. ARG. Car seems to be running ok. Just needs a bit taller gear out back but Ill wait and see how she runs as is before I do any more to the driveline. Jimmy comes over with parts to put trans back to lockup. Note: Because of time and money constraints the car is running a stock stall (1,650) Precision converter. 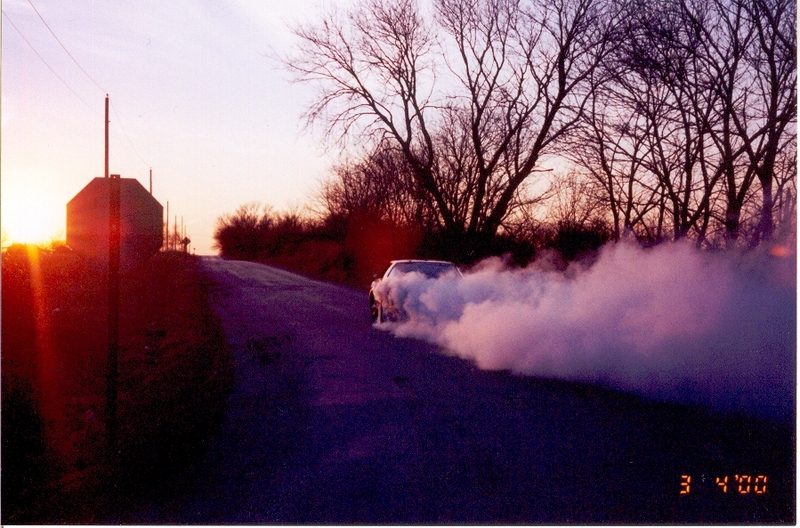 This will be removed in spring and replaced with a proper Coan anti-balloning 2,500 stall TC for nitrous use. Drive back to IL to pick up 99 Z rims and snow tires to put on the car for the winter. As soon as i get into town the trans starts to go out on me by not shifting into 4th. Take the car to trans shop on the 9th, pronounce trans D.O.A. Buy rebuilt race trans from my buddy Jimmy. Get old trans out and new one in. Fire the car up and the TC is locked up in all gears. Turns out the trans is setup for non-lockup and we have a lockup TC. 150hp jets swapped into nitrous system. Haven't sprayed with the 150 yet cause I think my trans is on its way out. Installing NOS nitrous system. It is a plate system that uses 2 fogger nozzles in the plate instead of a bar system. The system is all in sans retard box, bottle brackets, and bottle heater. I have run it just a few times with the 100hp jets in. The seat of the pants feel of the system is very disapointing. I blame it partly on the location of the nozzles, partly on the low HP im shooting, and partly on the fact the car is running very rich and needs tuned. Watching the the speedo needle climb when the system is activated, I can see that it definitly is working. Next step is tuning and the 150hp jets.